There is confusion involving the names of Capua and Santa Maria Capua Vetere. Essentially, the Campanian amphitheater was built in a place called Capua. In the Christian era, that town became Santa Maria Maggiore and, in 1861, Santa Maria Capua Vetere (ancient); today's Capua was built nearby in the 800s. Read all about it in Capua, A Short Tale of Two Cities. The Campanian Amphitheater of Capua (now Santa Maria Capua Vetere) was built at the end of the first century AD and the beginning of the second. It was the second largest Roman amphitheater after the Colosseum in Rome (which was built between 70-80 AD) and was modelled on it. The one in S. M. Capua Vetere measures 165 meters on the long axis and 135 m on the shorter one. It replaced a smaller structure, the remains of which have been identified to the south-east. The provincial museum of Campania holds a plaque dedicated by emperor Antoninus Pius (reigned from 138 to 161) that mentions restoration of columns and new sculptures put in place by his adoptive father, emperor Hadrian. The Capua structure was the home of the first and most famous of all gladiator schools. (Amphitheaters, themselves, in Italy seem to have been a Campanian invention. The earliest one is in Pompeii (from 70 BC). Indeed, the amphitheater was built to host gladitorial games and followed classical specifications just like the Roman Colosseum in terms of the architectural “orders”—that is, the established proportion and design of stories and columns, etc. There was internal and external access to various levels in opus latericum brick work, the dominant form of wall construction in the imperial era. Three levels bore, together, 80 arches, each with an ornate keystone bearing likeness of divinities, mythological personages and theatrical masks. Some of them are now in local museums and elsewhere. In 456 AD, the waning days of the western Roman empire, the amphitheater was sacked by Genseric, king of the Vandals. It was rebuilt in 530 by the Goths; this would be slightly before the devastating Gothic wars broke out in Italy (the period in which Justinian regained at least for a while, Italy for the empire.) Both the Goths and the later Longobards used the amphitheater for gladitorial combat. 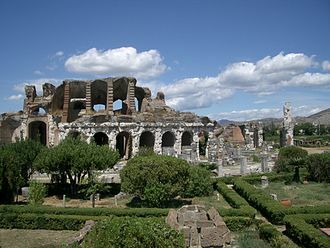 That did not cease until 841 when Saracens destroyed the town of Capua and the amphitheater was turned into a fortress. When the Hohenstaufen dynasty of Frederick II took over in 1200, the amphitheater became a ready-made quarry for stone for the construction of urban dwellings. The site was partially excavated between 1811 and 1860, and between 1920 and 1930 was finally completely dug out from the great masses of earth accumulated over the centuries. Since then it has been through numerous episodes of restoration.